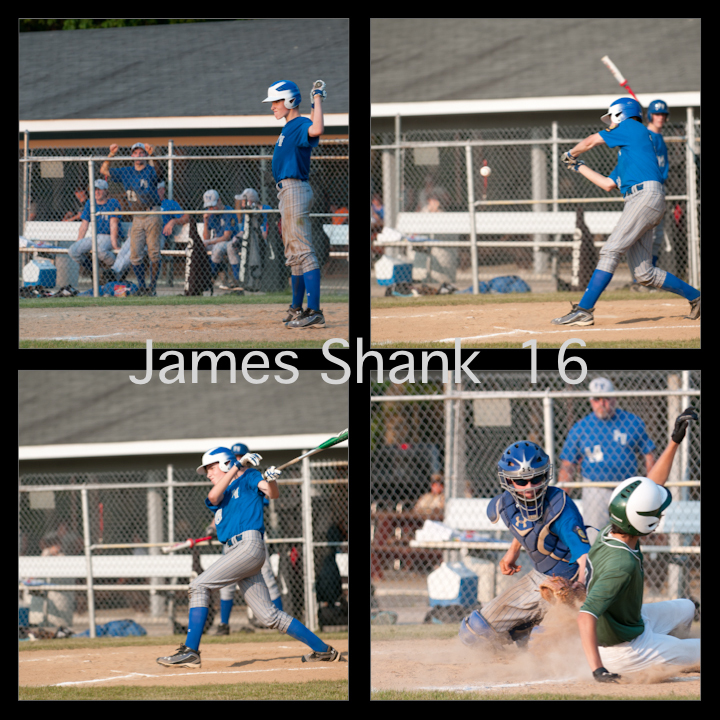 Sports photography is a passion for me! There is nothing that quite beats the challenge of capturing the action on the field with my camera. As play after play unwinds, the story of the game is told. My job as a sports photographer is to capture and tell this unique story through photographs. A single photograph, or even a photo album of photographs is one traditional way to tell the story and remember a game. But today there are better and different ways to recapture a special moment on the field or re-live a game. 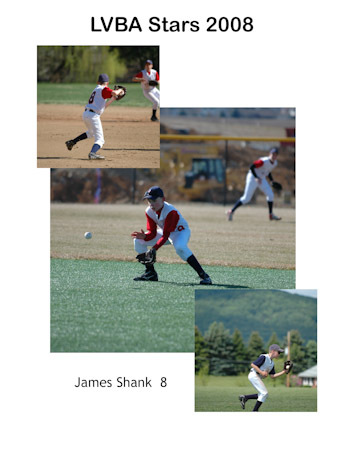 One popular way to capture a game or a complete season is to create a photo book, which includes photographs compiled nicely in a photo book. There are many alternatives to this method including soft-covers and hard-covers, one photo per page or several photos per page, and much more. You can see a sample of photo book here. 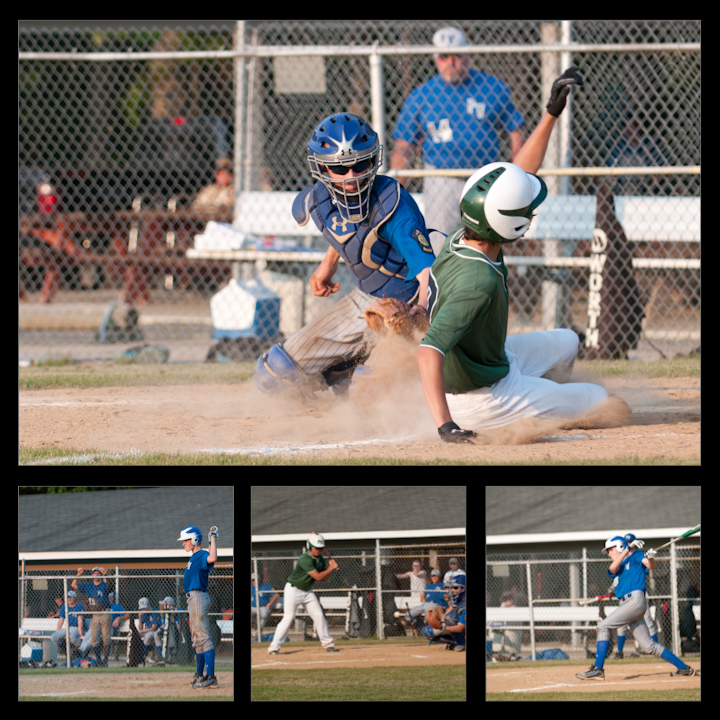 A custom photo collage of a play or a game is another option that can highlight a great play on the field or a victory. 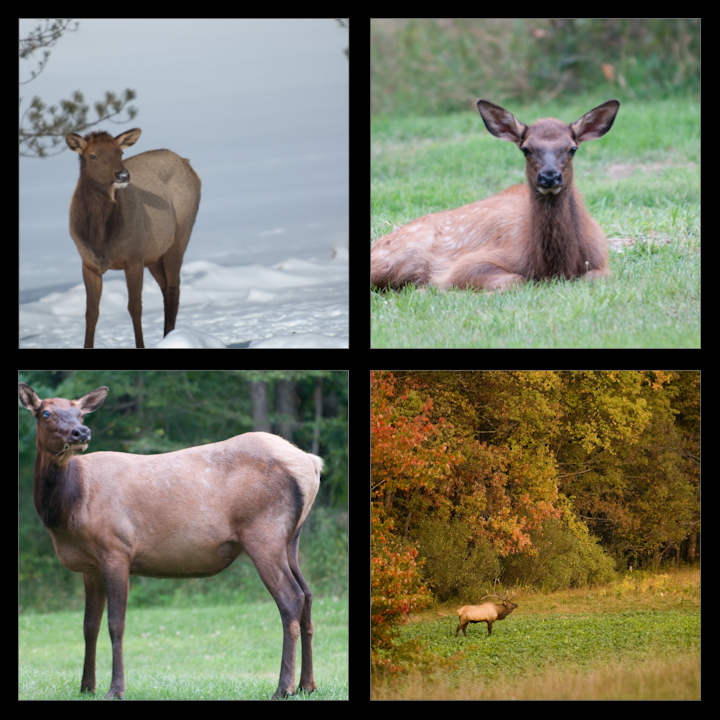 I create these custom collages in Photoshop by including several different photographs and soften their edges to help them blend together in an attractive way. You can see one sample here and some more here. Photo collages can come in all sizes, shapes, and varieties. I like to include several different options. The 4-Photo Collage is a simple, straightforward design. It highlights four equally-sized photographs in the four quadrants of the collage and highlights the player name and number in the middle. 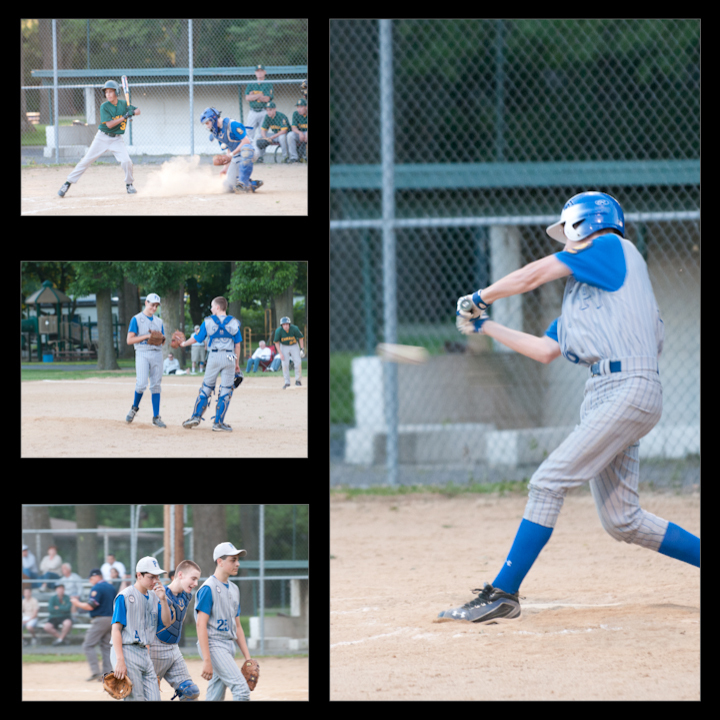 The 3×1 Photo Collage is the perfect way to capture great plays or a hitting sequence like a triple. 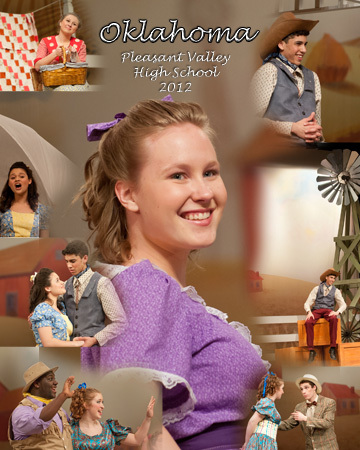 The one side of the collage features a vertical photo while the other side features three smaller photos. 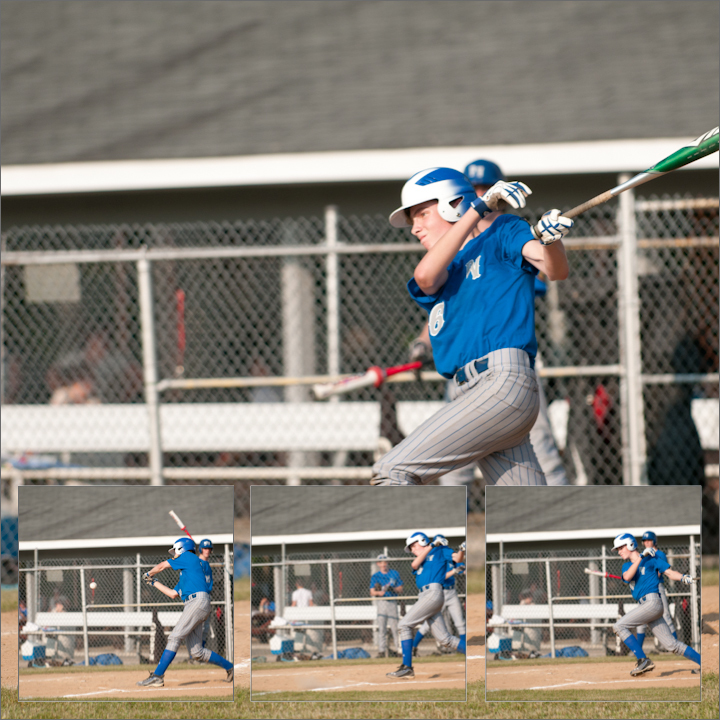 A triple could be documented in this way: the player hitting the ball on the vertical side with each of the three smaller photos featuring the player running around the bases. 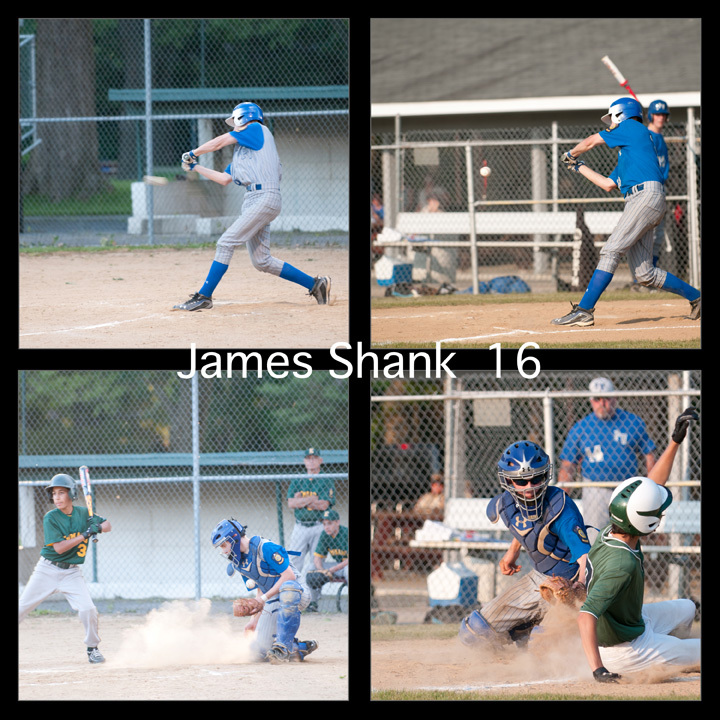 A defensive play could be displayed in a similar fashion on one of these custom collages. 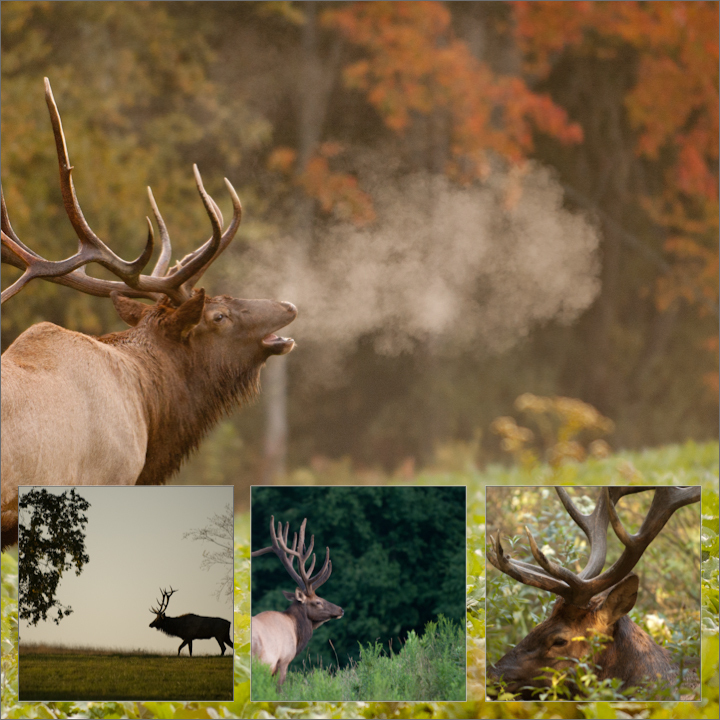 The 3-Photo Collage is a nicely laid out presentation including one large photo in the middle and two supporting photographs overlaid to create a more artistic display. This can also highlight a great defensive or offensive play, or any combination of desired photos. One of my favorite options is what I call the Teamsake Collage. 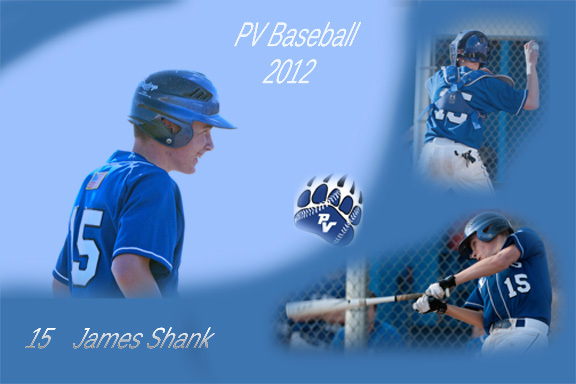 The idea behind this collage is to include several teammates on the collage to remember a special season. Players bond together during a season and this collage provides a way to remember your teammates in a great way for many years to come. 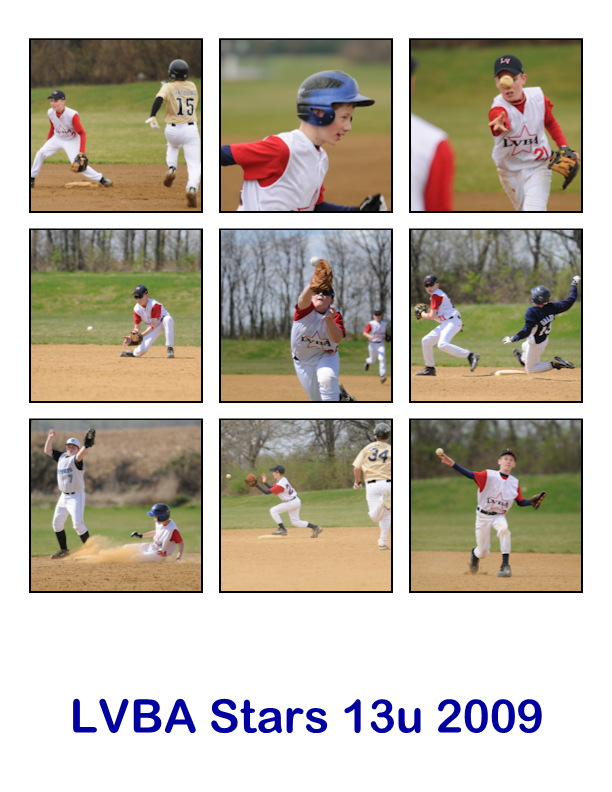 This layout includes 9 equally-sized photographs so the starting lineup of the team can be included, or just a variety of favorite teammates can be featured. It’s all up to you! Collages are just one one example of the great options available today. Photo buttons, trading cards, calendars, greeting cards, mouse pads, magnets, and Stick Pix, which are like FatHeads that stick to the wall, are also available from any photograph in my galleries. You can view some of the options here. These options make perfect gifts for Christmas, birthdays, and graduation! Over the years of creating my photography website, I tried to find better ways to make these products available for purchase. 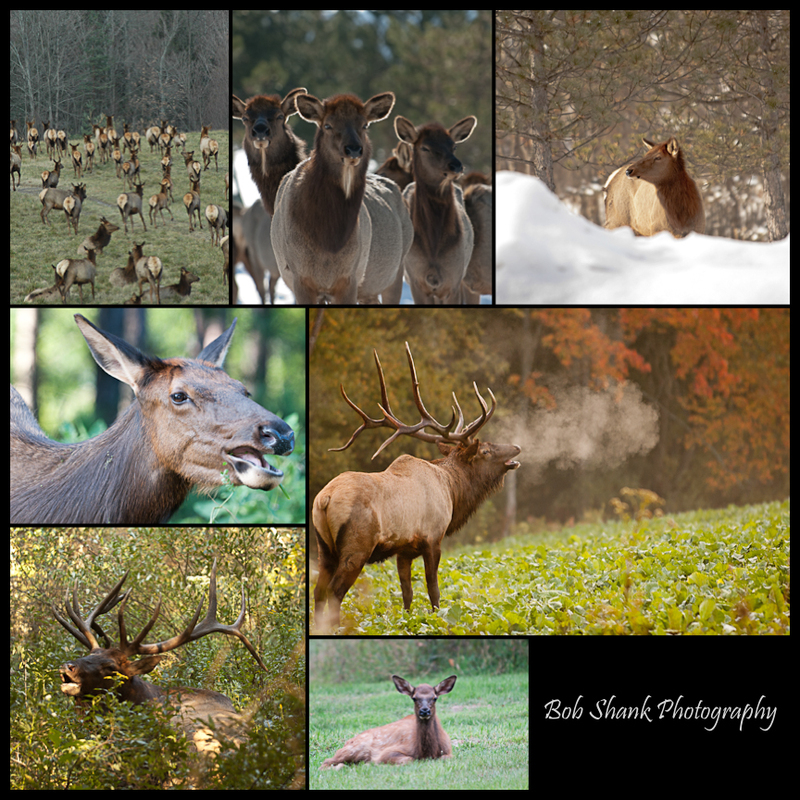 I currently offer many of them directly in the photo galleries when you click on and enlarge a photograph. Prints, buttons, magnets, and trading cards are easily selected in this way. I will be including the other options soon, but some are not so easily available in this manner. For example, the photo colleges need to include more than one photo obviously. Finding an easy to follow method to choose and include the exact photos presents a dilemma. I am experimenting now with some new ideas and hope to have this available as soon as possible. In the meantime, if you want to purchase a collage, just email me and I will get it together. Photographs make special and unique gifts. There are a variety of ways to take a photograph and turn it into a creative keepsake. I feel my job is to “capture the moment” and make a memory for a lifetime. These sports photography products help to deliver this goal! Yes, I confess; I am really having fun creating photo collages these days! A combination of events contributed to this. One contributing factor is the photo shoots I’ve been fortunate to photograph this week. 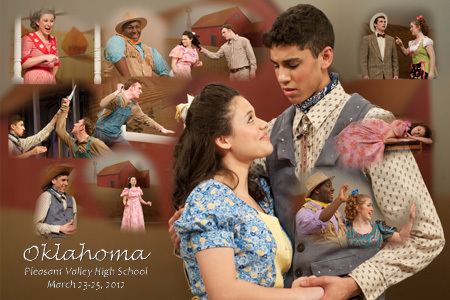 Pleasant Valley High School’s performance of Oklahoma and the baseball games are just two quick examples. Then, my brother, shared some tips on how to better create photo collages. All this is helping the creative side of my photography interests and I have to say I am thoroughly enjoying this new-found challenge! What do you think of this photo collage? Yesterday I was inspired to write a blog post about creating a Lightroom template that looked like a matted print. This forced me to troubleshoot a specific problem: how to post the template file on my photo website so guests could download them. The solution didn’t take long to figure out and I quickly installed the iZip software on both my desktop and my laptop. 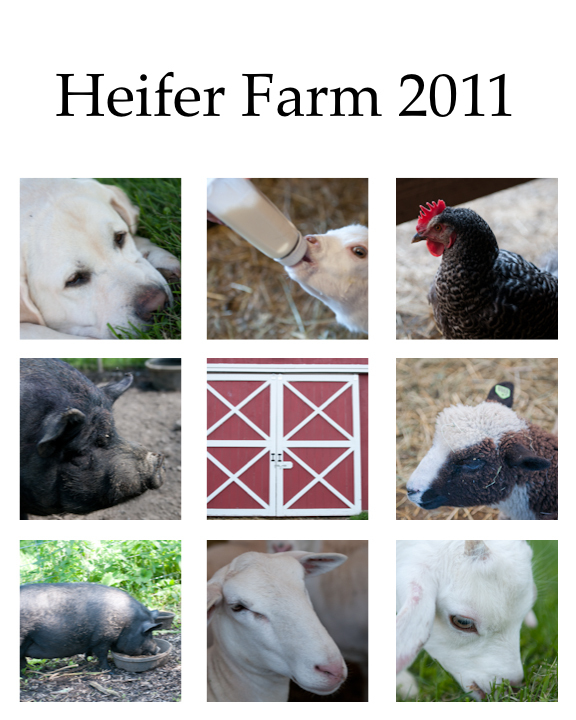 I zipped the template and was able to post the zipped file on a page on my website to share with others. So then I thought I should also share some collage templates for anyone who might want them. You might recall that in two previous blog entries I shared some insights on several different collages I created in Lightroom. Some of these collage templates are now available on my website and you download them here. I hope you find them helpful and useful. They are easy to use and should at least provide some thoughts for you to consider when creating your own collages in the Print Module. Directions are provided on my website as to how to download these templates. Once they are installed in your version of Lightroom all you have to do is click on the title of the collage in the left column, which brings the template up in the main screen area. Then just drag the photos of your choice from the thumbnails at the bottom of the screen into the cell boxes on the template. It’s that easy! I prefer to first create a Collection to narrow down which photos I want to use in a specific collage. I hope you find this helpful. Drop me a line and let me know. Adobe Lightroom is my most favorite photo-editing software. I can quickly go through an entire photo shoot, pick the keepers, do some quick touch-up edits of some photos, and post them as a gallery on my website. It is awesome! 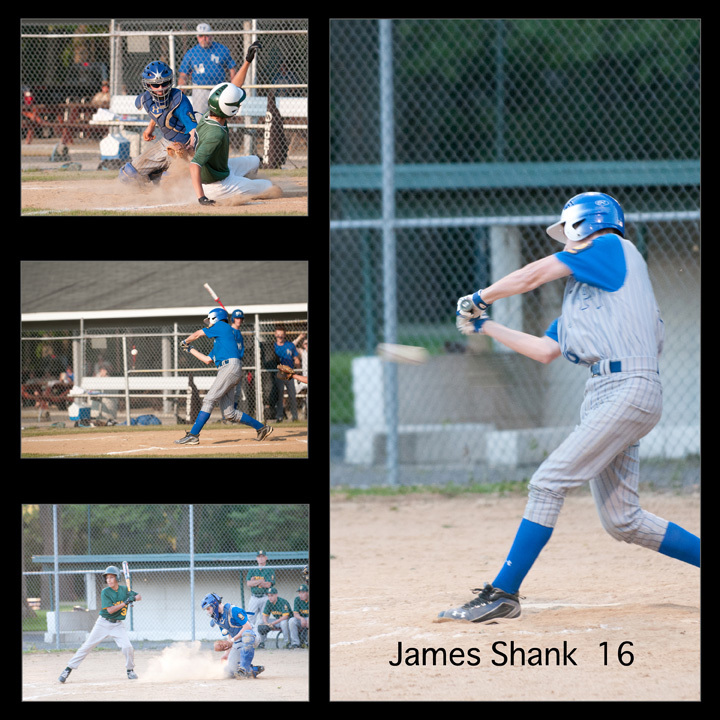 I still do use Photoshop for some more advanced editing and creating some collages, like the ones I do for the high school baseball seniors. Photoshop certainly has its place and I do keep it within arm’s length, but more and more I find additional features in Lightroom. 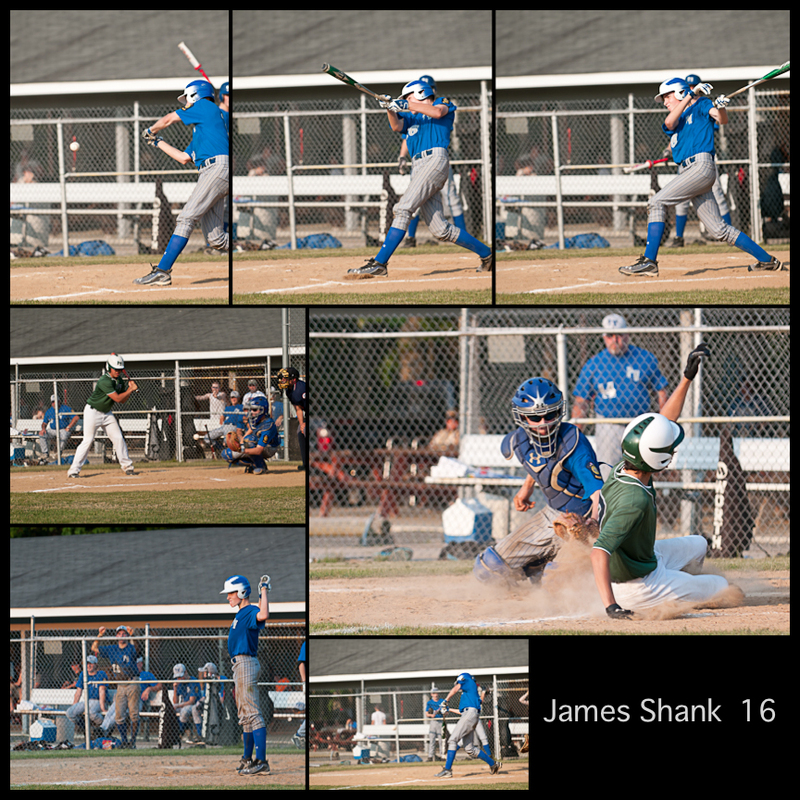 A recent example is creating collages right in Lightroom. 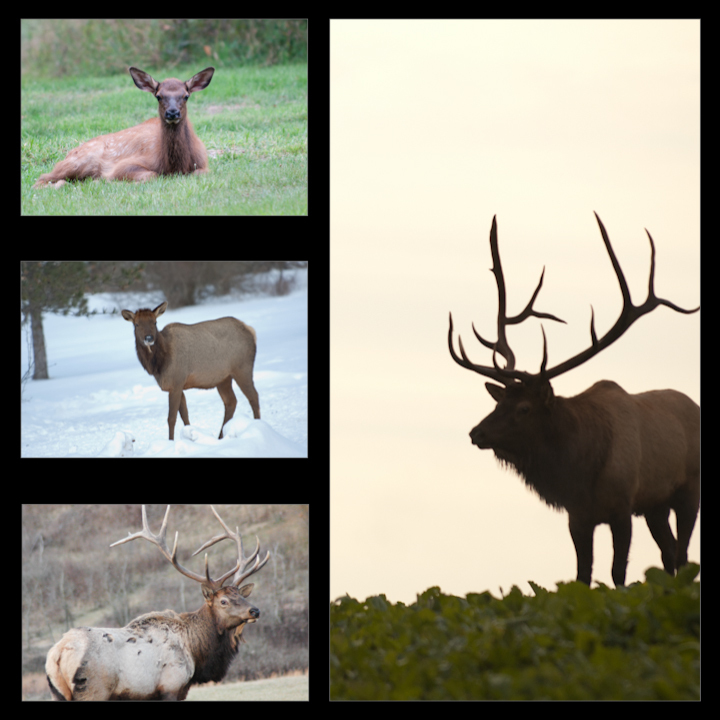 A photo collage is a great way to share the highlights of a vacation, a baseball game, a musical, or any other subject captured with your camera. Here are five samples that I was playing with the other night. (You can click on each image to see a larger photo of the collage.) I think they make great photo keepsakes. What do you think? Which one do you like best? 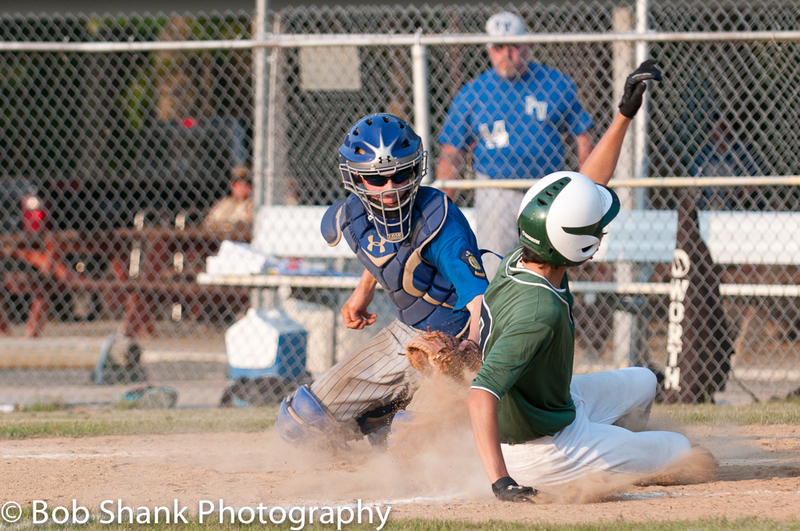 I enjoy photographing baseball as many of you know. I love the game of baseball and trying to capture the action and excitement on the field is one of my favorite past-times. Recently, I am enjoying the creative side of photography by making custom collages. I made a collage for each of the six seniors on the Pleasant Valley Baseball Team, which the Booster Club gave to them at their banquet. I was able to create a custom background and then dropped photographs of each senior into their custom collage. This year’s version of the senior collage was greeted with much enthusiasm. 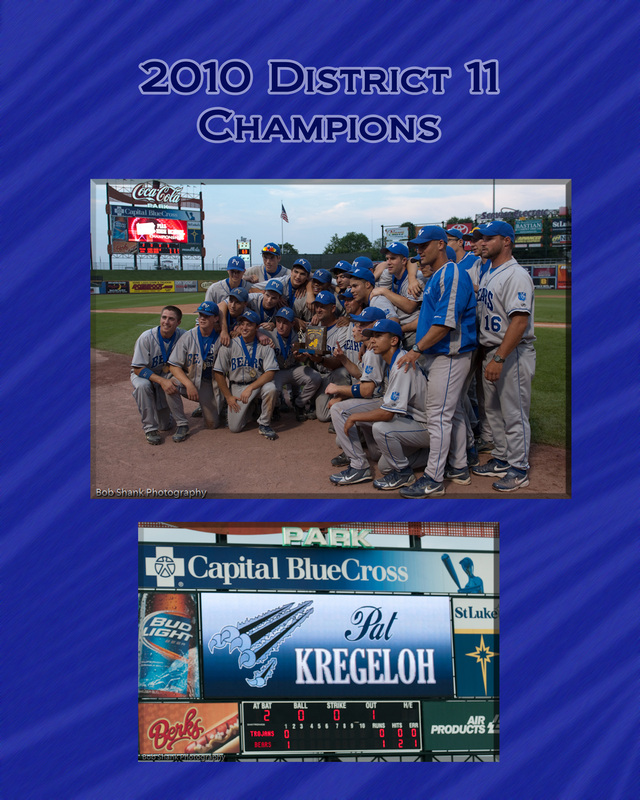 Below I posted a similar collage from the Pleasant Valley District Championship Game, in which they defeated Parkland by a score of 5-0 at Coca-Cola Park the home of the AAA Iron Pigs. 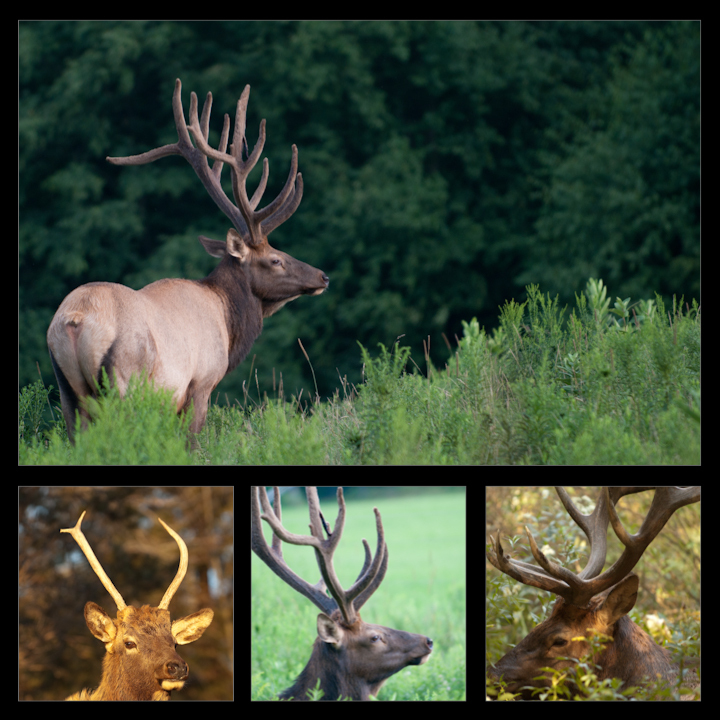 Check out the custom collage and see what you think of it. A Dream Come True in a Big Way! Two years ago I was photographing my son at baseball camp while he was attending the Ripken Academy in Aberdeen, Maryland. One of his games was on Ripken Stadium which featured photo wells for photographers to shoot the game right beside the dugout. So started my dream–I hoped to one day be able to shoot a minor league baseball game from a photo well. Well today I photographed from the photo well at Coca Cola Park, the home of the Iron Pigs in Allentown, PA. I was there to photograph the District 11 AAAA Championship between Parkland and Pleasant Valley. It was so sweet! I have been extremely busy the past two months shooting many baseball games and watching the PV High School team dominate most of their opponents. The racked up some big scores, mercy-runned several of their opponents and kept on winning! Now they are District Champs and go on to play in States. You can view some of my work here. I hope you enjoy the collages I created. They are custom made–my first decent attempt at creating an interesting background for the collages.